wxGUI is a native Graphical User Interface (GUI) for GRASS GIS. Its main features include displaying geographical data in 2D and 3D, calling GRASS GIS modules, and interacting with data. The Layer Manager includes map layer management, integrated command-line prompt, and command output window tab. The Map Display Window integrates basic tools for zooming, panning, data querying, and map elements (north arrows, barscale, etc.). Each display window is associated with its own set of map layers in the layer manager. The user may start multiple map displays during a session. The map layers for each display are grouped under different tabs in the Layer Manager. Module dialogs enable running GRASS modules. The Layer Manager provides an interactive graphical interface for creating and managing GRASS displays. There is a toolbar to manage displayed map layers, a layer tree frame in which map layers for display are organized, a command output window tab, and interactive command line prompt. 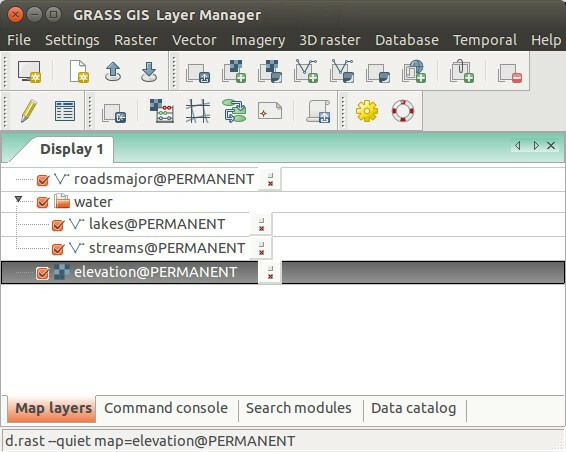 On Linux and Windows platforms, the layer manager also has a menu bar with a set of pull-down menus for all GRASS GIS functions (analysis, file I/O, GIS configuration and management); on a Mac, the GRASS functions menu is at the top of the screen. The top left button of the toolbar opens a new Map Display Window. Each map display has a unique set of layers to display and region settings. Other toolbar buttons add layers of different types for display in the selected map display window. There are additional buttons for saving or opening workspace file, and others. Map layers are listed in the window frame below the toolbar. Layers can include raster and vector maps, vector labels, and commands (where any GRASS command can be written). Layers are displayed as arranged in the layer tree: the bottom layer is displayed first and the top layer is displayed last, as if the layers were a series of stacked overlays. The check box to the left of each layer makes it active or inactive for display. Only active layers are displayed/redisplayed when the display button is pressed. Layers can be organized into groups; entire groups can be activated or deactivated for display. Layer tree composition can be saved to a workspace file and opened in subsequent sessions, restoring all layers and their display options. A right mouse click on a layer or left clicking the button to the right of the layer opens a dropdown menu with options to remove or rename the layer (not the actual map), change its display properties (d.rast and d.vect options such as color, symbol, etc. ), show its metadata (r.info, v.info) or attributes, if applicable. A left mouse double click on a layer opens GUI for its display options These options are those for the d.* command for each layer type (d.rast, d.vect, or d.grid, for example). Removes all layers from the layer tree and creates a new, empty tree where new layers can be added. Opens an previously saved workspace file, containing a set of display layers and their option settings. Combines and displays three raster maps defined as red, green, and blue channels to create an RGB color map, see d.rgb. Combines and displays two or three raster maps defined as hue, intensity, and (optionally) saturation channels to create a color map, see d.his. Adds shaded relief raster map layer, see r.relief and d.shade. Adds map of raster cells with directional arrows drawn. Arrow direction and length are determined by separate aspect/directional map and (optional) slope/intensity map, see d.rast.arrow. Adds layer for thematic display values from a numeric attribute column associated with a vector map. Options include: thematic display type (graduated colors or point sizes), methods for creating display intervals, SQL query of attribute column to limit vector objects to display, control of point icon types and sizes, control of thematic color schemes, creation of legend for thematic map, and saving the results of thematic mapping to a ps.map instructions file for later printing, see d.vect.thematic. Adds layer in which pie or bar charts can be automatically created at vector point locations. Charts display values from selected columns in the associated attribute table. Options include: chart type, layer and attributes to chart, chart colors, and chart size (fixed or based on attribute column), see d.vect.chart. Add a layer of text from a labels file for vector objects created with the v.label module. A labels file can also be created with a text editor, see d.labels. Add layer to display rhumblines (for latitude/longitude locations only), see d.rhumbline. Opens vector digitizer to allow editing selected vector map. Import selected raster data into GRASS using r.in.gdal and load them into current layer tree. 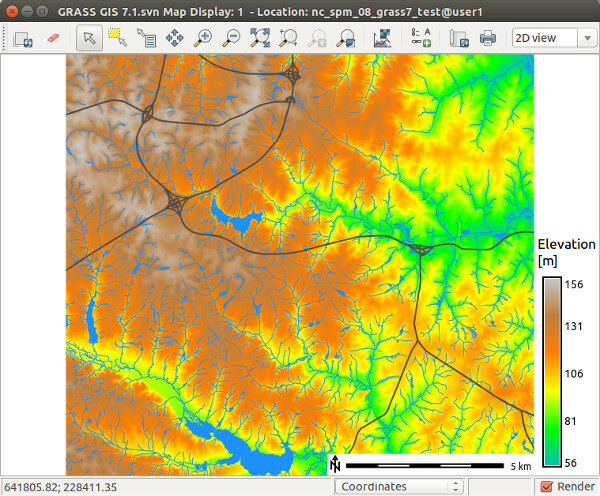 Link selected external raster data as GRASS raster maps (using r.external) and load them into current layer tree. Import selected vector data into GRASS using v.in.ogr and load them into current layer tree. Link selected external vector data as GRASS vector maps (using v.external) and load them into current layer tree. The map display window includes toolbar that can be docked and undocked from the window, a map canvas where a map composition of one or more layers is displayed, and a statusbar with information about the geographic region of the maps displayed. Each Map Display Window has a unique layer tree (in the layer manager) and geographic region setting. At the top of the window is a toolbar with buttons to manage the map in the display (render, erase, zoom and pan), for query and and analysis (distance measurement, profile, and histogram creation), to overlay map elements onto the display (scale, north arrow, legend, and custom text), and to export or print the display. In the statusbar, the user can choose to display the geographic coordinates under the cursor, current geographical region extent, computational region (including graphical visualization in map display), map display geometry (number of rows, columns, resolution) and map scale. Checking the render button in the statusbar will cause the map display to update automatically any time a map is added to, removed from, or changed in its layer tree. It is important to note that zooming in any display will have no effect on the 'computational region' setting (set with g.region). Only by selecting the 'Set current region to match display' item in the zoom menu (in the map display toolbar) will the current display extents be copied to the computational region extents. Re-renders all active map layers regardless of whether they have changed or not, see d.redraw. Erases the currently selected map display to a white background, see d.erase. Interactively select features from given vector map. Selection can be stored to a new vector map, see v.what and v.extract. Query selected raster, RGB raster (all three map channels will be queried), or vector map(s) using the mouse. Map(s) must be selected before query. Vector charts and thematic vector maps cannot be queried. The results of the query will be displayed in a dialog. See r.what, v.what. Interactive selection of a new center of view in the active display monitor. Drag the pan cursor while pressing the left mouse button to pan. Panning changes the location of the region displayed but not the size of the area displayed or the resolution. Panning does not affect the computational region for other GIS processes, see g.region. Interactive zooming with the mouse in the active display monitor. Drawing a box or just click with the mouse (left button) and zoom-in cursor causes the display to zoom in so that the area defined by the box fills the display. The map resolution is not changed. Clicking with the zoom-in cursor causes the display to zoom in by 30%, centered on the point where the mouse is clicked. Zooming resets the display region extents (both size and location of area displayed). It does not affect the computational region for other GIS processes, see g.region. Interactive zooming with the mouse in the active display monitor. Drawing a box or just click with the mouse (left button) and zoom-out cursor causes the display to zoom in so that the area displayed shrinks to fill the area defined by the box. The map resolution is not changed. Clicking with the zoom-out cursor causes the display to zoom out by 30%, centered on the point where the mouse is clicked. Zooming resets the display region extents (both size and location of area displayed). It does not affect the computational region for other GIS processes, see g.region. Set zoom extent based on selected raster or vector maps. Zooming resets the display region extents (both size and location of area displayed). It does not affect the computational region for other GIS processes, see g.region. Set zoom extent based on the current computational region extent, see g.region. Returns to the previous zoom extent. Up to 10 levels of zoom back are maintained, see g.region. Zoom to saved region. Zooms to previously saved named region. Set computational region extent from display. The computational region (the mapset's WIND file) is set to match the current display extent (does not change the resolution), see g.region. Set computational region extent interactively. The computational region is set simply by drawing a box with the left mouse button on Map Display. Set computational region from named region. This option doesn't affect display zoom. Interactive measurement of lengths defined with the mouse. The length of each segment and the cumulative length of all segments measuered is displayed in the command output window frame. Lengths are measured in the current measurement unit. Double-click to switch off measuring. Interactive measurement of area defined with the mouse. Area is measured in the current measurement unit. Double-click to switch off measuring. Interactively create profile of a raster map. Profile transect is drawn with the mouse in map display. The profile may be of the displayed map or a different map. Up to three maps can be profiled simultaneously. Interactively create bivariate scatterplot of raster maps. Displays histogram of selected raster map or image in new window. Adds layer to display a scalebar. Options include scalebar placement (using screen coordinates or a mouse), scalebar format, and scalebar colors, see d.barscale. Adds layer to display a north arrow. Options include north arrow placement (using screen coordinates or a mouse), north arrow style and color, see d.northarrow. Adds layer to display a line of text using default GRASS font (selected with d.font). Options include: text placement (screen coordinates); and text size, bolding, and color, see d.text. Prints map on system native printer or PostScript device; saves visible map display (including PostScript text and labels) to PDF or EPS file. Puts display into vector digitizing mode and opens a new digitizing toolbar. The user can digitize a new vector map or edit an existing map. Puts display into raster digitizing mode and opens a new digitizing toolbar. The user can digitize a new raster map or edit an existing map. or by the environmental variable GRASS_GUI. The GUI can be quit by selecting the 'File -> Exit GUI' menu item. On MS Windows when GRASS is launched without an interactive command line this will end the entire GRASS session. In other cases the terminal window will remain running; type exit at the command prompt to end the GRASS session. wxGUI is a native Graphical User Interface (GUI) for GRASS GIS written in Python using wxPython library.